It’s Time to Dine Deliciously. When it comes to flavor, variety, and ease of preparation, pureed meals sometimes fall short. We’re here to change that. Our NEW Thick & Easy® Pureed Meal Kits provide you with all the courses you’ll need to prepare several days worth of tasty pureed meals–all in one convenient package. Our Lunch/Dinner Kits contain more than 30 courses, enough food for 6 or more meals each, while our Breakfast Kits provide 31 items, for 9 or more nutritious meals. 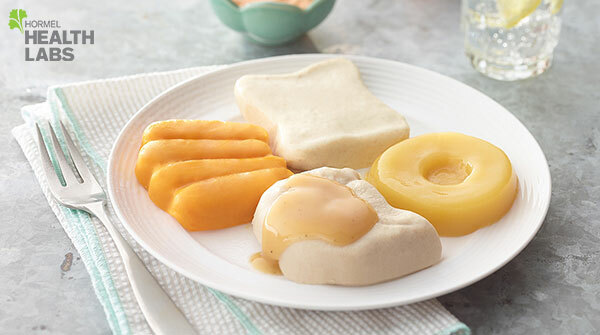 Developed by chefs who understand both flavor and swallowing difficulties, our Pureed Meal Kits go beyond meeting consistency standards–they provide a delicious, flavorful alternative to bland, monotonous purees. And they’re easy to prepare. Please enjoy 25% Off your first Pureed Meal Kit order by entering the promo code GOPUREED at checkout, and enjoy dining deliciously!